Loss of a tooth is a highly disturbing experience. It not only causes that physical tooth loss but also has an emotional impact on the patient. Aside from the obvious problems of poor physical appearance and damaged self-esteem, missing teeth also cause subsequent dilemmas like loss of chewing ability or ineffective speech. There are many replacement modalities for missing teeth. But the most preferred method would be a fixed replacement using dental implants. Dental implants are substitutes for the roots of missing teeth and are designed to last a lifetime. Dental implants pose an inherent advantage of bearing a close resemblance to natural teeth. This is due to the nature of the implant where it fuses to the jawbone, and hence resembles a root of the natural teeth. Dental implants are uniquely stable, eliminating the need for removable or partial dentures. They can also serve as an anchor for other dental prostheses like crowns, bridges, and dentures. The gold standard of an implant prosthesis is that one can perform day to day activities such as eating, speaking normally and even have a strong, confident and an aesthetic smile. At Malligai Dental Hospital Chennai, our oral surgeons don’t just “place dental implants”, they have trained and dedicated their careers as dental implant experts. Attributed mainly to the many years of specialized training with the most advanced facilities, Malligai Dental Hospital Chennai is now known to be the go-to place for dental implants with the highest success rate. Frequently asked Questions pertaining to implant surgery. Factors contribute to the success of Dental Implants? How frequent should be my visits to have my implants checked? How long does the whole implant process takes? Do i have to be without teeth during the treatment process? Are there same day implants? What would make me an unideal candidate for implants? When can i return to work after implant surgery? I have diabetes. can i still have implants? The amount and quality of the bone and good oral hygiene are the most important factors for long-term success of a dental implant. Caring for dental implants would be the same was one maintains natural teeth. The patient is advised to brush and floss twice daily, and rinse the mouth post each meal. The implants can be checked on a regular dental visit, which is mandatory every 6 months once. The entire process is dependent on various factors. For instance, if there is a good bone quality, implant placement and temporary tooth can be fixed within a day. The final crown will be cemented within a weeks time. If the procedure for various reasons takes longer a temporary crown may be given. No.We would be giving a temporary crown. Yes, it is possible if there is a good quality of bone and no infection at the site. Prior to implant placement, all active infections including gum infections have to be treated. A compromise in the immune system caused to infections, medications etc can also act as a limiting factor. Last but not the least, smoking too is a threat factor when the long-term success of dental implants is required. It is usually performed as a 'keyhole surgery' using a local anesthesia and is a relatively painless procedure. Post surgery, there may be minimal pain and discomfort which can be easily subsided using painkillers for a short duration. There is commonly no need to be absent from work following implant surgery. Yes, but two important factors are that your blood sugar level is well-controlled and that you preserve a good oral hygiene. Dental Implants are widely divided into two types conventional and basal depend upon the teeth fixation time. It is also divided by the types of material it is made of and also by the type of crown it is going to have on the top. Dental Implants are a great piece of solution for patients who are in need of Fixed teeth and no difficulties of wearing a Removable Denture.It is probably the best thing Dentistry can offer to the mankind. At Malligai Dental Chennai the price of aan Dental Implant is based upon parameters like the type, single implant or multiple,immediate placement or delayed, the brand and the quality of the dental implants we use. Things you need to know!!!! Many of my patients are willing to go for implants but they are little scared of the procedure.Dental Implants are very safe and if it is done by a trained Specialist then it is really a boon to the desired patient. 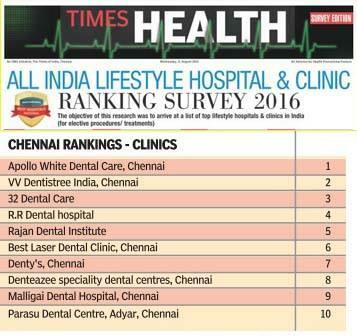 Malligai Dental Hospital ranks the 9th among the top 10 Dental Hospitals in the city of chennnai.